If you want to give your boring and outdated kitchen a mini makeover, consider updating your kitchen cabinets. Doing so can instantly provide a fresh look to your entire kitchen and up both the style and functionality of the space. Therefore, when you don’t have the budget for a full kitchen renovation project, this is one easy fix you can try. In today’s blog post, we’ll give you some simple tips and tricks to update and upgrade your kitchen cabinets to transform the appearance of your kitchen. It’s one of the most popular budget-friendly ways to change the colour scheme of your kitchen and give it an instant facelift. Choose semi-gloss enamel paint for the upper and lower cabinets in your preferred shade that complements the walls and kitchen island. Professionals will first remove drawers, doors, pulls, knobs and other hardware from the cabinets. After cleaning and sanding all the surfaces, they’ll apply two or three coats of paint. Crown molding can add a distinctive personality to your existing kitchen cabinets. If you have drab builder-grade cabinets, give them the illusion of a stylized height by installing crown molding. A smart way to do it is to use a hardwood frame to mount the molding. Attaching the frame and the crown will allow no nail holes to fill and once attached, the entire assembly can be easily installed above the cabinets. Installing good lighting on cabinets can provide a surprising improvement on how your kitchen looks. 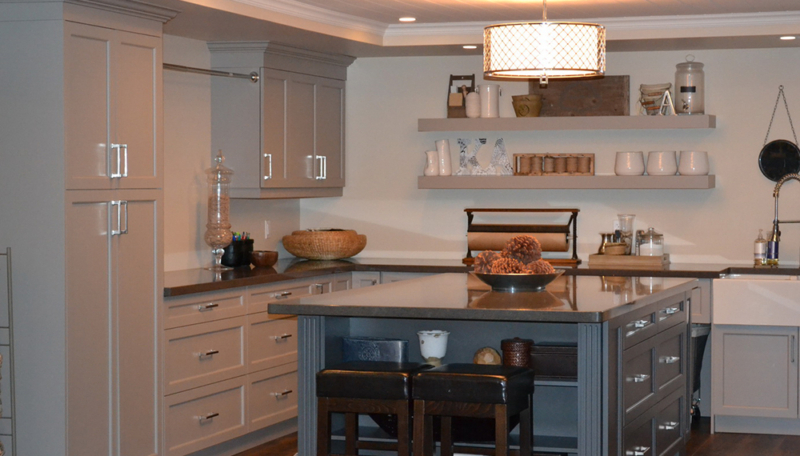 Consider adding task lighting under the upper wall cabinets to make the countertop glow in bright white light. It’s a great idea to select dimmable lighting as it gives you the liberty of adjusting the lighting according to your work and mood. Also, if your kitchen cabinets can accommodate uplighting, then install LED tape lights on the top cabinets. This kitchen cabinet upgrade is more about adding functionality than aesthetic improvement. Roll-out cabinet shelves in your bottom cabinets can help you make the most of your storage space. These shelves function like a drawer where you can store items in the back of the cabinet. They can be easily accessed by rolling out as and when needed. If you want to transform the entire appearance of your kitchen cabinets, you can replace them with new cabinets. It’s one of the most straightforward ways to provide a brand new look to your kitchen. Depending on your budget, you can choose the material, design, and style for your cabinets. The backside of kitchen cabinet doors offers a potential storage space and this is often not considered. Install a spice rack on the backside to keep tiny bottles organized neatly. Replace your existing hardware such as pulls, knobs, and bars for the quickest fix to get a fresh look. Utilize the unused space underneath the upper cabinets by installing open shelves or racks to store plates, baking sheets, mugs or other kitchen tools. This simple addition will transform both the appearance and functionality of your existing kitchen cabinets. Try out some of these ideas to spruce up your kitchen cabinets and see the difference they make in your kitchen! At Euroline Kitchens, we provide custom kitchen cabinets and full kitchen renovation solutions for different needs and budgets. Our experts can help you create your dream kitchen by providing excellent workmanship. Request a quote today!